There will be minor spoilers in this. I just don’t see a way around that, sorry. In case you don’t know, “The Hunger Games” is based on the first book of the Hunger Games trilogy, by Suzanne Collins. The Hunger Games is a post-apocalyptic dystopian story about country that has replaced America (and possibly Canada, it’s vague) with a dictator state. Once upon a time, a civil war was fought within this country, and when the rebels lost, the Capitol declared that every year after that, there would be an event to remind the districts of the futility and ugliness of war – The Hunger Games. Each year, one boy and one girl is randomly chosen from each of the 12 surviving districts to compete in a hand-to-hand battle to the death. 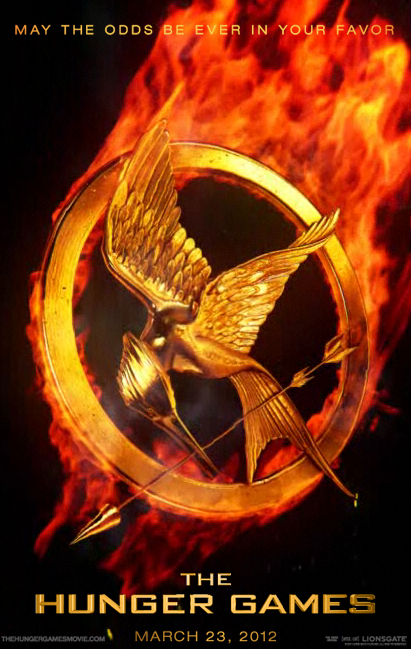 Katniss Everdeen is the female competitor – “tribute” – from District 12. Her performance in the games causes a ripple effect throughout the country, so strong that even the tyrannical President Snow can’t take his eyes off her. We were so impressed with how the movie was done. Since “Hunger Games” is written from a first person limited point of view, like “Twilight,” I was curious as to how they would communicate all of the backstory and Katniss’s internal monologue (fyi – “internal dialogue” only exists in “The Host”) but it was handled well. Primarily, they grew the secondary characters so that they could interject the, “In case you don’t know, trackerjackers are…” dialogue where necessary. What I loved was how much foreshadowing they brought into story. Since the book was written inside Katniss’s mind, readers are limited (although enthralled) with only what is going on immediately around her. In the movie, they were able to go behind the scenes into the gamemakers’ perspectives and even make President Snow more in the foreground, so we can see the effect Katniss is having on Panem as we watch the Games. Very effective, and while it creates all sorts of content not in the book, I think it was necessary. The other thing I want to comment on – and this is where the spoilers really kick in – is how they handled the Peeta/Gale/Katniss element. Parts of it were good. Thankfully, we didn’t spend a half an hour in the cave with Katniss forcing herself to make out with Peeta. That part was appropriately abbreviated. And they did bounce back to District 12 a couple of times to see Gale grimace in pain whenever Katniss and Peeta do kiss. But there wasn’t nearly enough introspection on Katniss’s part during this process. I get that they were trying to avoid turning her into another “will-I-or-won’t-I” Bella, but I think that could have been done while still showing the conflicting emotions Katniss experienced. They didn’t go much into Katniss’s ambivalence for Peeta, not nearly as much as the books anyway, but that doesn’t really surprise me. If, at the end of the movie, she had blown him off the way she did in the book – and without the audience having a chance to see into her thought processes – I think they were afraid it would lose a lot of the goodwill Katniss had built up with the audience throughout the movie. So they left that out and made it ambiguous, so that those of us who had read the books would see it because we were looking for it. And I’m still firmly Team Peeta and SoldierMan is still firmly Team Gale. Even though we both know how it ends. And really, this movie couldn’t have been better cast (except for Haymitch. I can’t stand Woody Harrelson and I think Kiefer Sutherland would have been ideal. But they didn’t ask me.). Jennifer Lawrence is a perfect Katniss. She’s not whiney, even though she’s got plenty to whine about. She’s strong without being abrasive. And I did cry when she volunteered at the beginning. I knew I would, but still. Josh Hutcherson, who plays Peeta….boy, he grew up nice. And he tears your heart out over and over, subtly building to the major “mushy” moments that Peeta is primarily responsible for in the story. Liam Hemsworth as Gale doesn’t get much screentime, but he gets more than in the book, and promises to be a treat in the later installments. And my word, Stanley Tucci as Caesar Flickerman. You got excited every time he appeared on the screen. Man, he’s good. Overall, I think it was a fantastic adaptation that respected the source material but also was able to carry along people who had no familiarity with the book. And even at 2.5 hours long, it never dragged and kept you engaged. In fact, we’ll probably go see it again before too long. The only real negative is that almost the entire movie is filmed in ShakyCam. Which would be unforgiveable if the rest of the components weren’t so perfect. Did you see it this weekend? What did you think? I liked it but I didn't love it. I didn't feel it was as epic as the book, but can it really be? I expected something more... well, epic, like LOTR. Buuuuttt that being said, it was exactly how I saw it in my mind. The settings, the cast, everything. I think they handled the book to movie translation wonderfully! They left out the stuff that didn't really need to be said (like how she got the pin) and emphasized the important parts. I'm another who liked but didn't love it. I realize its hard taking a(n?) internal monologue styled book and turning it into a movie, and I'm grateful it wasn't like twilight (I'm so not a fan of mushy love ruining my action scenes), but it just wasn't enough detail, enough information, and enough heart-stopping details. I feel like everything got whitewashed. But then again, I only really liked this book, the other two books had the same problem as the movie for me. To "meh". And by heart-stopping details, I meant heart-stopping moments. Opps! I havent seen it yet but maybe next week! I'm waiting a few more days before dragging Brian to see it. I'm finding it really hard to explain it to him besides "It's kinda like Running Man, but with kids and teens killing each other." I just leave him more confused each time. I was Team Gale until I want to say somewhere in the second book, though, it could have been the third, then I flopped over to Team Peeta. And Shaky Cam? Crap. I hate that crap. I love love love the book so I was extremely worried about the movie but the previews had always looked so good. Once I saw it, I was not disappointed. I thought they did a really great job! Loved it. But you know that already. I'm normally not a fan of the shakycam but I thought it was used well in this case because it kept the more gruesome things from being shown. The biggest complaints I've heard about the books have been from people who haven't read them...yeah, I know...frustrating but it's understandable because summarizing the books can make it sound pretty creepy...children forced to fight to the death. Between the shakycam and the camera angles, there was really very little gore in the movies.